Extreame Savings Item! Free Shipping Included! 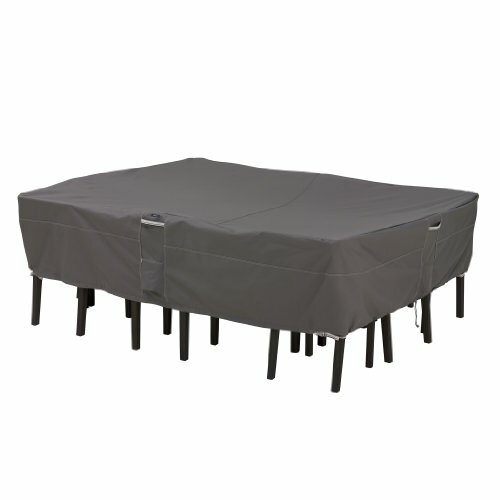 Save 46% on the Classic Accessories 55-156-055101-EC Ravenna Oval/Rectangle Patio Table and Chair Cover, X-Large, Taupe by Classic Accessories at The Mirror Project. MPN: 55-156-055101-EC. Hurry! Limited time offer. Offer valid only while supplies last. The Ravenna table and chair covers from Classic Accessories combine a striking style with durability, fade-resistance and convenient features. Please refer to your furniture’s care instructions as some finishes, sealants or coatings could react to PVC backed covers. To reduce this possibility, the use of a support pole (sold separately) is recommended to elevate the cover. Our covers are not intended for furniture made of concrete.